Architecture relates to the design and construction of buildings, temples, houses and other structures used for human habitation. In Ancient Greece public buildings were often made of marble because it wasreadily available. They used post and lintel construction so the roof was supported on tall columns. This was the same method of construction that was used in ancient Egypt. Walls were kept to a minimum because they shut out light from the sun. Heating was done on open fires and chimneys were not used. Fires were usually located in a courtyard. The structure was built up of smaller blocks of marble joined with metal pins. No mortar was used. The size of a room was limited by the length of the lintel. Wood was used for larger lintels while stone was used in ones that lasted longer. On surviving buildings some are missing their roofs because the wood lintels have rotted away. Water was provided to public fountains that could be in such a room but not part of a house. The ancient Greeks built public buildings as a direct result of their religious practice. Many public buildings were temples for worship with a secondary purpose. The local temple of Hestia maintained a fire so the local people could get a light if their home fire went out. Some of the temples were used a treasuries. Others were used a meeting places. Buildings were made of wood or stone. The wooden buildings were post and lintel. The stone buildings were made of stones set without mortar. A metal key was used to keep the stones from sliding. Roof beams were built from wall to wall with extra support provided by columns. Above the lintels roof beams formed a triangle so tile could be layed on the upper surface of the roof. Overlapping of the tile assured that rater would run off the roof. Buildings were divided into separate rooms that allowed the separation of the sexes as was practiced in the society. Even though the Greek wives were secluded in the Greek homes, they were able to enjoy the architecture of the culture because they left their homes when they participated in the religious festivals. The temples and public buildings were often decorated with sculptures and images that included both men and women. about where materials can be acquired, how to put things together so they are safe and functional, and how to organize people to get the job done. In ancient Greece architects used aesthetic rules to produce building of great and lasting beauty often using fairy simple materials and methods. used this art to decorate temples, marketplaces, cemeteries, and other places where the deities would need to be influenced. For the most part such art was public and little was used to decorate homes. They did produce much more art than was needed for these purposes so the art was exported. And it was a popular and profitable export. But when the old religion was broken by the influx of Christianity in 125 AD, the art stopped too. Stereotypes about Women in Ancient Greece? The literature suggest that women in classical Greece were confined to their homes, separated from men and restriced in their activity. But their depiction in art and in the decoration in the architecture does not support this. Most of the deities of the ancient Greeks were women and they were depicted as beautiful and powerful. Literature even documents a slave culture which is hard to identify in the art of the time. Many have suggested that there were stereotypes about women, but this idea is not supported by their art. The art reveals a wonderful variety of roles and types. Question: what exactly is Doric architecture? the other forms which include the Ionic and Corinthian orders. Question: What building methods and materials did the Ancient Greeks use? Answer:They used wood and stone in a post and lintel construction. Lead was used to pour pins into the stone and clay was fired into partly cylindrical tiles for the roof. The building methods and materials used by the Greeks came from Egypt where they had been in use at least a thousand years. What was unique about the Greeks was not the materials or the methods, but the design. The Romans incorporated new methods and materials such as arches, vaults, facades, and concrete, but they stuck to the Greek designs. 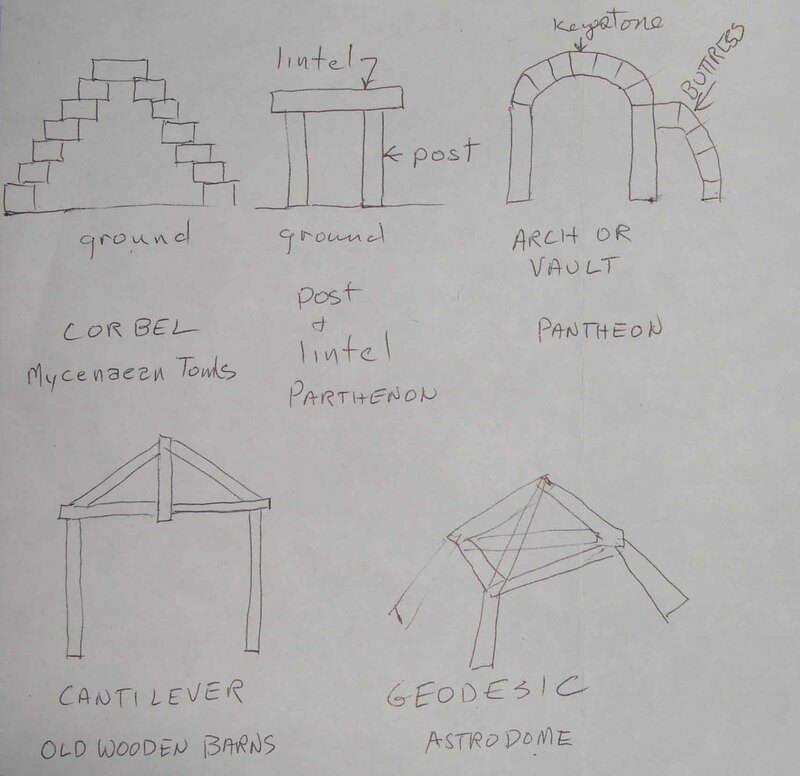 Various construction types from ancient Greek to contemporary. Question: How did they use their building tools? Answer: Mainly they used hand tools. They held the tool in their hands when they used them. A chisel was held in one hand while the hammer was held in the other. The hammer was used to strike the chisel. Some compound tools included cranes and bellows. When they carved a large block a projection called a boss was carved on each side. A rope looped over both projections allowed the block to be lifted by the crane. Question: What is a adze, auger, chisel, mallet,and dressing tool? adze — an adze is similar to an ax but the blade is perpendicular to the handle. It is used mainly on wood to smooth a board. auger — an auger is used to drill holes. It is often just a rod with a flattened triagular point on one end. The other end is square and passes through a perpendicular handle. When the pont is placed against wood the handle can be turned and a hole made in the wood. chisel — a chisel is a round bar with a flattened end ground to a sharp edge. When used with stone it is held in the hand and the other end is hit with a mallet or a hammer. mallet — a large chunk of wood or leather with a bar handle through the middle and projected out. It is held by the handle and used to pound things such as pegs or chisels. It differs from a hammer only in that a hammer is made of steel. A dressing tool — This is a chisel with a straight edge that can be used to smooth stone and make it flat. A chisel with a curved edge is call a gouge. adze, auger, chisel, mallet, dressing tool, simple tools of ancient Greece. 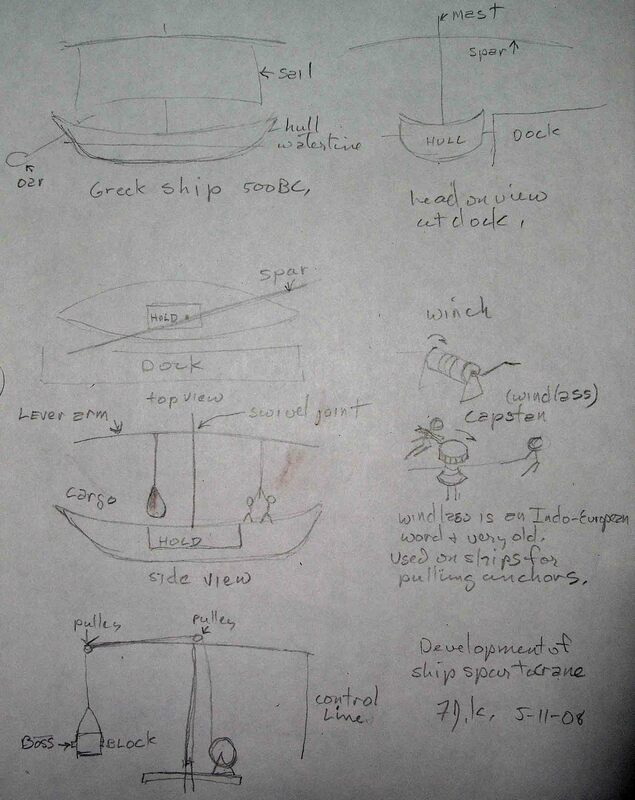 The crane used by the ancient Greeks was probably developed from the use of spars and masts on ships. Question: how was a theatre made? Answer: The Greeks used a hillside or a natural depression in the earth. the center. The seats were stone blocks set in circles up the hill. Opposite the seats a raised stage would be set. In Ancient Greece in the Clasical times and before only the Temples were decorated. Arches were developed by the Romans and did not really appear in ancient Greece. It was the Romans who first adapted the Greek temple decoration to every sort of building and structure. In fact the Greek temple had a rather exact method of decoration. The classical Greek roof was of marble slabs with timber framing and sloped gently. It rested on columns in a post and lintel construction. The inner chamber of the temple is called the naos. In front of the naos is the nave surrounded by columns. Surrounding the naos and the nave is another row of columns. Just inside these columns are aisles. Greeks preferred a peripetal design with the naos in the center of the building. Inside the naos was often a cult statue and a plinth that served as an altar. A naos may also contain an adyton, an inner area restricted to access by the priests. The naos is typically a simple, windowless, rectangular room with a door or open entrance at the front behind a colonnaded portico facade. A pronaos is the inner area of the portico of a Greek or Roman Temple, situated between the portico’s colonnade or walls and the entrance to the naos. Entasis refers to the slight tapering of the columns as they rise, to counter the optical effect of looking up at the temple. The effect of these subtle curves is to make the temple appear more symmetrical than it actually is. The Greeks also employed tile drains and conduits as well as tiles for roofing. Their architectural ceramics were mostly confined to cornices and cornice adornments and are customarily classed as terra-cotta. The entablature is the part of a classical temple above the columns between a capital and the roof. It consists of the architrave, frieze and cornice. The architrave is the lowest part of an Entablature that rests immediately on the Capitals of the columns. The triangular space just below the ends of the roof, the pediment, contain the friezes. The cornice is the highest projecting part of an entablature above the frieze. The antefix are covers at the edges of a roof on all four sides of a building. The cover tiles are the second layer that cover the joints of the first layer of tiles on the roof and end in decorative relief representations. The pediment is the triangular gable between a horizontal entablature and a sloping roof. The metope is a slab of stone sculpted with reliefs that on a Doric frieze alternate with triglyphs. These are panels of decoration around the temple above the columns and below the roof. Every Greek temple has a peaked roof running the length of the building. The triangular space just below the ends of the roof are decorated with a frieze. This is a slab of stone sculpted with reliefs that on a Doric frieze alternate with Triglyphs. A Triglyph is a decorative element of the Doric Frieze that alternates with the Metopes and is formed by three grooves, or glyphs. The shaft, the tall part of the column, supports the capital, often decorated. The column sit on the base except in the Doric order which has no base. The Metopes and the Friezes are typically decorated with reliefs. The topics reference the myths of ancient Greece and perhaps more. Doric Architecture is the oldest and simplest of the three orders of classical Greek architecture. It is characterized by a column with no base, a fluted shaft, and a plain capital. In the Doric order the columns have a polygonal cross section. Ionic Architecture is neither simple nor ornate. Columns are decorated with flutes except in the Doric order. Ionic capitals consist of a scrolls above the shaft. Temple of Apollo Epicurius, Bassae, c. 450 BCE. The Parthenon, Athens, 447-432 BCE, Ictinus and Callicrates, architects. Question: what do the buildings look like? known? and what is there names? and how did they look? and Pylos. These seem to have influenced images of the deities in classical Greece. became a Latin church. Turkish conquers converted it to a Mosque in 1458.
has been a ruin ever since. during the 19th century. Greece contends they were stolen and wants them back. Publication: Pharaohs Fellahs and Explorers. by Amelia Edwards. New York: Harper & Brothers, 1891.
the design of a fresco is quite thin, 1/8 of an inch. Question: What is the Greek symbol for sports or peace of mind or travel? a symbol as well. In the Odyssey Athena brings peace of mind to Odysseus. A Caryatid is a column in the form of a draped female usually dressed in a peplos. The Erectheum at Athens had such columns. Also karatid, kartid is a sculptured female figure serving as an ornamental support in place of a column or pilaster. It was a frequently used motif in architecture, furniture, and garden sculpture during the Renaissance, the 18th cent., and notably, the classic revival of the 19th cent., when caryatids were popular as mantelpiece supports. The motif appeared in Egyptian and Greek architecture; the most celebrated example extant is the Porch of the Caryatids, forming part of the Erechtheum. Here six beautifully sculptured figures, acting as columns, support an entablature on their heads. Caryatids were used also in two small treasuries (6th cent. B.C.) at Delphi. Male supporting figures are called atlantes. The Caryatids from the south porch of the Erectheion were done about 420 BCE. They supported the roof of the south porch of the Erechtheion, and probably were the work of Alkamenes, a student of the great sculptor Pheidias. Each wears a peplos, with apoptygma, and a short cloak (perhaps doubled) over her shoulders. This is the costume worn by many other female figures in the late fifth and the fourth century of ancient Greece. In Vitruvius 1.1.5 he states: The female figures in architecture that supported burdens are said to have been called Caryatids in token of the abject slavery to which the women of Caryae (a town in Laconia near the borders of Arcadia, originally belonging to the territory of Tegea in Arcadia) were reduced by the Greeks, as a punishment for joining the Persians at the invasion of Greece.” But this is not likely true because they do not appear to be suffering. Furthermore they seem to be wearing the polos, a headress usually reserved for a goddess. Rather they are more likely derived from a statue of Artemis in Caryae. Because of their multiplicity they do not appear to be statues of Artemis. Nor are they statues of followers of Artemis as they would be dancing as was the custom in Caryae. The idea of using females for support seems to go back to Phoenician art but I cannot find any examples of this. Anopther possible influence is the fact that the women of ancient Greece carried water in jars on their heads. An example is: Two women with jars on their head. Atlantes atlantz [Latin plural of Atlas], sculptured male figures serving as supports of entablatures, in place of a column or pier. The earliest (c.480-460 B.C.) and most important example from antiquity is in the Greek temple of Zeus at Agrigento, Sicily. The baroque architecture of the 17th cent. made considerable use of atlantes, as did the classical revival in the early 19th cent. ” Reference. Walls might have been decorated, but no paintings survived. but sometimes pebbles or stone. Upper stories had wooden floors. protection and separated by narrow streets and alleys. were used for construction. People that lived in tents would have left no remains. Wood was used in the rafters, beds and doors, though some doors were actually made of stone. There were no hinges on the doors which turned on pins instead. Many doors were probably covered with cloth. Floors were dirt or stone and often rough. For this reason furniture was often three-legged. There was no plumbing so water had to be carried in and wastes carried out. In the Odyssey Homer describes a dung pile by the front door. Cooking was done over a open fire, probably in the courtyard. Stone beehive ovens were used to bake bread. Liquids were stored in amphora. Door of a house and a column of a porch? In Aeschylus, Libation Bearers 712 the word ‘ἀνδρών’ (andron), which in context means men’s room. This is the room where the symposium is held. This word is from Indo-European ner(-t)- ‘vital force; man’ and ‘reu̯ə-‘, ‘to open; wide’. ‘χρηστήριον’, ‘(seat of an) oracle’, In Aeschylus, Eumenides 194, dhēs- (used in religious terms) and ‘4. ter-‘, ‘to cross, get over, etc.’, This seems more religious communication than chair or tripod. Instead of ‘and not inflict pollution on all near you in this oracular shrine.’ the translation should simply be ‘and not speak as a god’. In Aeschylus, Libation Bearers 806 appears the phrase ‘καλῶς κτίμενον ὦ μέγα ναίων στόμιον’ which is translated ‘mighty, gorgeously built cavern’ but which is literally translated ‘beautiful (cavern) be inhabited in the mouth’. I wonder if the IE root of ‘κτίμενον’ is ‘kē̆t-‘, ‘room, dwelling place’ and ‘1. men-‘, ‘to rise, tower’ which implies a temple rather than a cave. 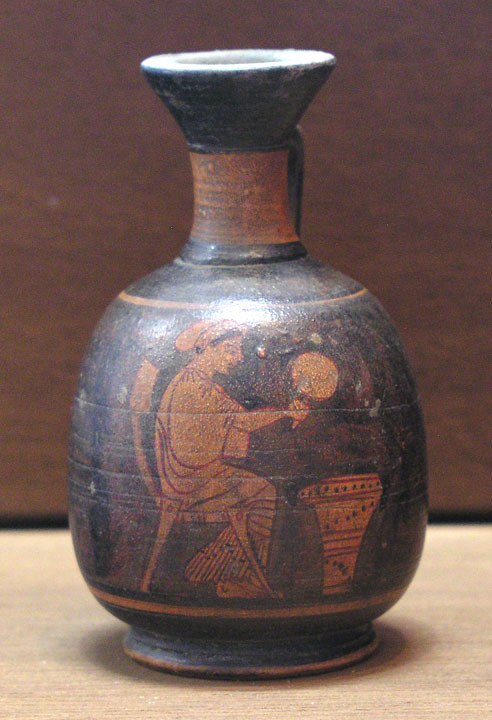 Ancient vase with woman sitting on klismos chair. The object in front of her could be a basket. She is dressed in a peplos and holds a mirror in her hand. Furniture was fairly simple but with a distinctive Greek style. flat on a rough floor. Greek furniture was made of wood and bronze. a three legged stool. The following picture shows the mistress of the house in the throne. During the classical period only the Cretans sat at tables to eat. Other Greeks lounged on beds while they ate. Even so if there was a chair only the most important person sat in it. Normally the table was beside the chair and not over it. Important women are pictured in chairs of the klismos type. A chair, a table, a stool and a small tripod. present two tripods to two heroes. The klimos chair with its curved legs was developed by the ancient Greeks. It is usually shown occupied by an important woman. The material was probably brass. In the following picture a bride prepares for her wedding. But she is not seated in a Klismos chair. A slave-girl prepares food on a feast table. was believed to be an aesthetically pleasing shape. Construct a golden Rectangle with side of length AB. Construct perpendicular OB at B with OB = AM. Draw line AO forming Right Triangle AOB. Mark off OD on AO so that OD = OB = AM. 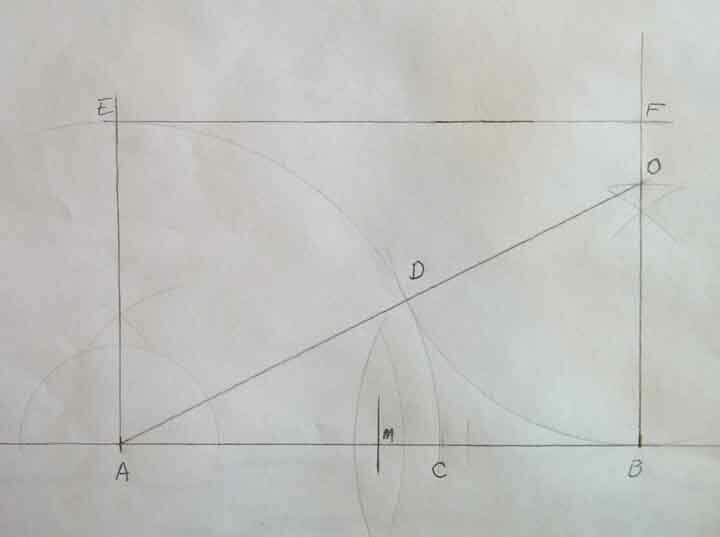 Construct pependicular to AB at A and mark off AE with AE = AD. Mark off F on BO so that BF = AE and draw EF. AEFB is the Golden Rectangle. One justification of the notion of the golden mean is given when Aritotle states: “it will follow that virtue has the quality of hitting the mean” (Aristotle, Nicomachean Ethics , Bk 2.6.9). Interestingly Aristotle discusses only an arithmetic mean. The ratio of the golden mean is indicated as φ. One of the advantages of the golden mean is that it is both arithmetic and geometric since it is true that φ + 1 = φ* φ. The golden mean is also used in the construction of the regular pentagon. peculiar to the Greek culture and can only be illustrated. BCE. The Ionic was more slender with deeper fluting and it stood on a base. grow on a plant native to Greece. Ancient Greeks did not make pictures of their architecture.